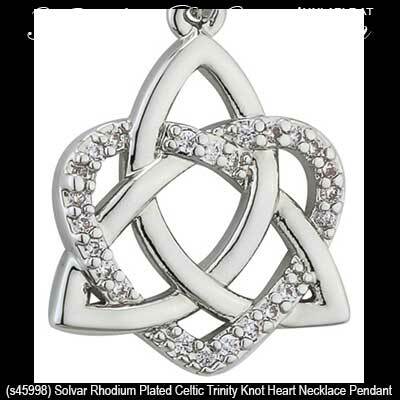 This rhodium plated Celtic necklace features a Trinity knot that is entwined with a crystal set heart. Rhodium Plated Celtic Heart Necklace with a Trinity knot and crystals. The Celtic pendant measures 5/8" Wide x 7/8" Tall, including the jump ring and the chain bail and includes a 19" long rhodium plated chain with a lobster claw catch and a 2 1/2" long chain extender with a tiny tassel at the end.